Denver's RiNo area has a young brewery that is gaining a lot of attention. River North opened up just over a year ago and the beers that they brew are getting a great reputation. 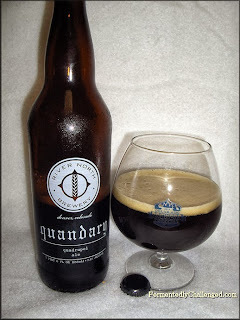 I visited them last year during the 2012 GABF week and they had several beers on tap and River North Quandary Quadrupel Ale was one of them. I only had a small sample back then and have always wanted to give this beer a full review. To my delight, I spotted a few bottles of River North beer at my local store in Northern Colorado. 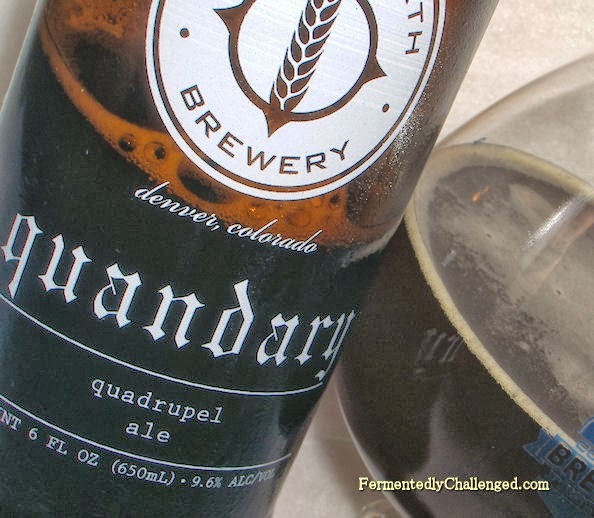 I grabbed the Quandary Quad and waited only a few days to open this bottle up. The beer comes in a painted 22oz bottle (no paper label). The beer weighed in at 9.6% ABV and a modest 24 IBU - powerful enough to warrant going slow with this one. Appearance: Quandary Quad poured out a dark mahogany color with some ruby edges along side of the glass. While the beer was very dark and just a tad cloudy, I could tell that there wasn't any sediment in the glass from the first pouring. I poured the beer semi-aggressively and got just a modest 1-finger tall light tan head that seemed to dissipate fairly quickly. What little lacing there was in the glass was rather slippery and didn't cling to the side of the glass. Yet, as the tasting session went longer, the lacing seemed to change and got more clingy. Aroma: The aroma on Quandary Quad smelled quite complex. There is noticeable Belgian yeast aroma, somewhat like banana, but not overly so. There was also a mix of dark fruit aromas like figs, dates or raisin and perhaps some Belgian candy in there as well. The overall scent was very inviting and reminded me of a Chimay Blue. There was also a lot of malty overtones. The yeast and the malts really took center stage here in the nose of this beer. Taste: Right off the bat I was a fan of this beer. I had let this beer warm just a bit after removing from the fridge and I'm glad I did. There was a big body to this beer, not light by any mean. The texture was creamy smooth too. The brew was not fruity per se, but the sweeter malts grabbed my attention. Mixed in the middle was a mild spiciness, perhaps from the hops. Oh wow. This beer tasted so inviting and delicious. The overall taste was semi-sweet, but not cloying by any means. The bitterness was light, but just enough to balance out the sweeter malt base. Given the higher ABV, there was a bit of a kick to this beer as well, but wasn't over powering. This beer tasted just what I expected a Belgian-style Quad to taste like. This was an outstanding beer. Overall: Back about a year ago, I had the opportunity to taste a barrel-aged version of this beer at River North Brewery and I thought I was in heaven. The regular version was outstanding as well and if you ever get the chance, try both side by side, but try this version first and then you'll really see what barrel aging can do to this beer. I would have no problem buying this beer again, in fact I hope my local store still has more. It was well worth the money. This bottle was big enough to recommend sharing with one other person. While some of you could probably finish off the entire bomber bottle yourself, I'd suggest going easy on this big beer. It's got enough flavor and kick enough for two. River North is quickly becoming one of the top Colorado breweries in my list and with Quandary Quad they have a quality hit in my book. Seek this one out and perhaps buy two bottles and age one. It should stand up to a few years of aging at least. But why wait if you don't have to? This was a quality beer and scores high marks with me. - River North inks distribution deal with C.R. Goodman. - River North to release an Abbey-style Dubbel.